I am Jovenal “Jovie” Narcise. I am an active runner and marathoner/ultrarunner presently staying in the Philippines. This blog is all about running marathons/ultramarathon and road races in the Philippines and other countries. I am bald, 61 years old, and started serious road racing/running in the early ’80’s. I could not think or remember how many marathon races and other lesser-distance races I have finished since then. I stopped running after finishing the 1997 Manila International Marathon due to “sensitive” assignments/deployments in “insurgent/terrorist” areas as an Infantry Commander in the Philippine Army. I started serious running again since the last week of October 2007 and at the same time started this blog. On my 56th birthday on May 17, 2008, I retired from the active military service with the Rank of Major General (Two-Star General) of the Armed Forces of the Philippines/Philippine Army after 37 years of dedicated service to the country. Since then, I concentrated on my running adventures and eventually created and organized/directed the Bataan Death March 102K Ultra Marathon Race (BDM 102) last April 2009 to commemorate the historical event. Since then, it became a yearly event. On the last Saturday of January 2011 (this year), the first official 100-Mile Road Race in the country was staged in the country and dubbed as the 1st BDM 160K Ultra Marathon Race. Due to its success, it is now considered as the first and most challenging 100-mile road endurance race in Asia. My wife is not a runner but she is always there to provide us with food for our “carbo-loading” before and after our marathon races and practice runs. Sir Jovie, I did LAM 2007 🙂 It was my first ever marathon. Was totally clueless about the distance. That’s probably why I was able to sign up for it. Arrived 2 days before the race and was really dizzy due to jetlag. I managed to walk almost half of the race and finish with a very disappointing time of 6:45hrs hahahaha But It was a very, very, very awesome experience. I love the race. I love the crowd support. Perfect weather. and of course the food after. I hope to get a retake on that experience and just pound on that finish time. Sir Jovie, congratulations on your marathon achievements. I migrated to the US and ran my first marathon (LA Marathon ’92). To date, I have finished 37 marathons, 22 ultramarathons (50k, 50 miles and up to 100 miles), and about 125 less than marathon distance. I am always honored to meet or discover Pinoys with the same interest. Let me know if you or your family are running this year’s LAM. This will be my 17th year. I’ve been pacing new runners the past few years. At 50, I still can run under 4 hrs if I want to. Keep it up and Mabuhay!! Benwah, thanks and congratulations on your running accomplishments. My son & daughter will be joining the 2008 LAM. For sure, I’ll be there for the 2008 City of Angels Half-Marathon and 2009 LAM. Good luck! Congratulations for your new site. Am also moving Marathon You Can Do it, to a new home, http://www.dailyrunningtips.com. am still learning how to use wordpress. Keep running buddy. Thanks, Constantine. My daughter and her boyfriend brought me to this new site. They are experts with computers and the Internet. For sure, I’ll be visiting your new website regularly. Keep on running, too! I just ran into your blog tonight. You have one interesting perspective as a runner. You lead, but you are also an individual. Maybe one day, I will also run the Pasig River Heritage Marathon. I just ran the L.A. marathon as well. It was so much fun. WordPress is a different animal. Just getting the hang of it. Anyway, I have the beginnings of a wordpress blog under qrunning.wordpress.com. Hope you don’t mind if I stop and say Hi! from time to time. I live in Southern California. qrunning, thanks for visiting and making a nice comment. you are most welcome to visit anytime. thanks also for including me in your blogroll. you have a nice blog, too! and very impressive stats!..you are a “warrior”..my snappy salute to you! Thanks. Coming from you, I take that as a high compliment! Run long, and be well. baldrunner, I came across your blog after googling “Infantry Marathon!” I too ran the inaugural race, although I ran the half marathon, finishing third. However, I was stationed at Ft. Benning at HHC Reception Station in the Hrmony Church area of post. I wanted to tell you that all finishers should have recieved a certificate and finishers medal that day. I’m very sorry to hear that you didn’t get yours. I remember the day being very cold and windy. If there is a way for me to help you retrieve one, I’d be happy to lend a hand. raider, thanks for the help. how i wish i could have a finisher’s certificate and medal for that inaugural infantry marathon. what happened with the marathon event? i could still recall Olson Hall, the Gym at the back of it, the Doughboy Oval Track, ParCourse, and the 2-mile route/dirt track infront of the Infantry Building..and Victory Drive! thanks for the visit and keep in touch! elaine, you are welcome. i am glad you enjoyed and hope your stay in boracay was a memorable one. good luck & god bless. Yes, feel free to link to my blog (heatherdaniel.wordpress.com) I love your blog and read it often. Thanks for the comments and feedback. mabuhay kayo sir and i am doing 37 pushup salutes for your service and 56 more for your birthday….GO ARMY! im noel one of your regular blog reader from fairview running club.hope to see you again in dnd-afp gintong pangarap.btw,iv some questions re the event,how they can identify who are the top 5 winer of age category,our bib # dont have a bar code.i sugest also that we should have a special award of youngest runner and oldest,my son 4 y/o also reg for 5k event.tnx. bugo2x, thanks for the greetings and for the push-ups!..hahaha! noel, my staff had devised a system to solve the problem & we are still “low-tech” with regards to technical aspects of running. i will make some arrangements with the committees involved to include a special award for the youngest runner. thanks for the comment & keep on running. Hi Jovie. As a long time runner, I’m very inspired by the fact that you are running again. I haven’t been with WordPress very long but I plan to get some posts in very soon. Hopefully, I’ll meet you before the San Francisco Marathon in August. I plan on running it just as a training run but living here, it’s something that I should do every year. Wayne, thanks for the visit and the nice comment. you should be able to participate in this marathon since you are a resident of the place. sure, i will try to see you or contact you once i reach SFO. thanks & keep on reading & running. Great to see your Badwater fotos, Sir Jovie. I followed the webcast and slept 3.5 hrs only. Jorge has been my role model ever since I stepped to ultras in 2002. I was invited to crew or pace but the notice was a little bit late. I can’t leave work for 3-4 days right now. We have a HS reunion in Las Vegas in Aug. Thus, I didn’t sign up for San Fran Mar. 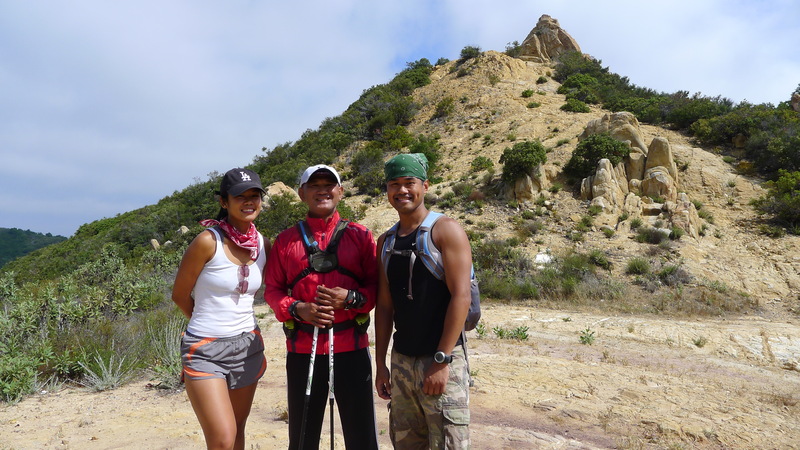 I’m currently training for my 2nd Angeles Crest 100 Miler along with another of our own (Pinay) in the race. We both finished last year. I saw pictures of The North Face sponsored 50k ultra in April in the Phils. I’ve seen a lot of hiking trails that we can use. Keep it up, sir. Cheers!! Hi BR. Nora has been trying to send blog messages to you wishing you and Johnny luck at the SF Marathon. I thought I would pass this along since she was able to contact me. Thanks and I’ll see you, the kids and Johnny soon. benwah, i am sorry for missing your comment unanswered. anyway, being at badwater and seeing all the elite ultra runners was a “dream come true” to me. moreso, when i saw them running towards furnace creek. i don’t know if i can do that. lately, i’ve been browsing ultra events in california and i am surprised that they are held almost every weekend during spring & summer. i hope to have my first ultra here in california. thanks for the comment. wayne, thanks & extend also my thanks to nora. see you soon! rayyoshi, i am glad you visited the philippines again. you can run without your shirt in manila but you should be aware of the “bakla/syokla” (gays) around you, they might run after you. i will be running the san francisco marathon this sunday with my son & daughter. good luck and thanks for dropping by again. we would like to invite you to join the “run for your life” on aug. 17 at the UP campus and can you please help us disseminate the information to the other runners? pls. email thumbieremigio@yahoo.com for details, thank you very much and more power to the bald runner! mountainrunner73, i am sorry to inform you that i am in the usa right now & would not be able to join your run. i hope to join you next time. thanks! Funny, I just realized Im as old as your children are, small world huh. SO how is your exercise and running going along in the states? And new pr for yourself? rayyoshi, which means that i am old already! hahaha! yup, i am 56 yrs old already and still trying to improve my time in the marathon. however, on aug 23, i will join the bulldog 50K ultra trail run at malibu creek state park in calabasas, california and this will be my 1st ultramarathon. who knows, i’ll be running my first badwater ultra after 3-4 years! yup! i am crazy! hahaha! I live about 10-15 mins from Silver Lake. Sorry, I wasn’t able to edit spelling typos. Nagmamadali kasi. I used to run around Silver lake when I was staying with my uncle near the lake. Also, there’s an interesting street in Silver Lake called Fargo St. Every Sunday after, St Patricks Day (April) there is an event called Fargo St Climb. It could probably steeper than any street in San Fran. website is http://www.lawheelmen.org Cross st is Allesandro (end of Fwy 2). Good luck on Saturday, Sir Jovie. Don’t be carried away by rabbits at the early part of the race. You’ll reel them back once you hit your stride. Walk if you have to particularly the Bulldog Trail portion. It would be hot (93 deg) so drink a lot of fluids. I take salt pills or endurolytes every hour. You’ll cross Tapia Creek 2x. You can have a drop bag at Tapia Creek AS if you want to change shoes. Otherwise, your shoes will be squeaky for a few minutes but will dry out soon anyway. I’ll try to get there before 12 nn after my training run. Nancy Shura said no-pacing rule. I’ll probably bring some foods for the volunteers. Nancy’s husband, Larry loves our empanada. If you were not able to get your running apparel, you may check out A Runners’s Circle http://www.arunnerscircle.com at Los Feliz/Riverside Dr. near Griffith Park. It’s the only Pinoy running store. They support the runningcommunity particularly at Griffith Park. Owners Joe and Randi are very helpful. Their running team is lead by our very own Chris Quesada who runs marathons under 3 hrs. ben, thanks for those nice and encouraging comments, to include your “golden tips” on how to run the bulldog ultra trail and the other info which are very helpful in my training. my main objective is to finish my 1st ultra and maybe, copy this concept in the philippines when i go back. i am planning for ultra trail events in historic sites in luzon and i am interested on the management/operation of your aid/medical stations. of course, featuring you and the rest of the pinoy ultra runners based in los angeles would be a nice post in this blog. thanks and hope to see you this saturday! Thank you so much for the race diary info from previous months. My family and I enjoyed running in Nasugbu, Manila and San Pablo for the months of July and August. I was looking for you every Sunday on races, however, I didn’t manage to see you at all. The last race I joined was the Human Race Nike in which I came 2nd, however, I was disqualified for not wearing the right kit. I left to one of the organisers one of my Royal Navy Running Shirt for them to hand in to you as a token. I wonder whether he managed to deliver it to you. I’m not very bad at remembering names but all I can remember was that he works for the Nike shop in High Street Fort Bonifacio. Once again, thanks and I hope to see you next year around the same months. I see that your running is still going very well, I’ve been training and haven’t had much in between training and work. Are you back in Philippines, whats new, I heard about a 10k at the fort on 26th of October, I’m running at 1/2marthon this Sunday and then a 5k then a 10k on 9th Of November on Guam. I ‘m thinking about the run at the fort on the 26th October, what are your plans? Thank you very much for accommodating me last night. It was nice to train with you. I am looking forward to joining more of your sessions. javy, our speed training is open for everybody. we will continue this program as long as there are runners willing to improve their finish times in every road race. the sessions are from 5:30PM-8:30PM every Tuesday, Wednesday & Friday. everything is free! see you again tomorrow. Life is short and eternity is sure. Some people are making an eternal mark, while others are just writing in the sand. Your Work will definitely leave a lasting impact. God bless you and keep your blog rolling…for His glory. Hi Sir Jovie! I’m Dr. Jun Kagaoan, 41 yrs old, a dentist from Vigan City, Ilocos Sur, a mountain biker, badminton player & newbie in running which I have started a few months ago and beginning to love it as my cross training. My friend informed me about your blog and it has been my daily routine since then to read your articles regularly and I find it very inspiring because of your thoughts, scientific because of your training program and it was really motivating for us newbies and professional runners as well. We have just formed our group here called “TARAYEM” acronym Trekking, Adventure & Running Advocates for a Youthful and Energetic Mind! Our aim is to promote running in our province and to develop potential runners to compete and represent TARAYEM and our province. We are planning to conduct our 1st Fun Run on February 14, 2009 dubbed as “Tarayem- Pusok Indengam man! It will be a joint project of the city government of Vigan and TARAYEM. I would like to invite you, your team, and all runners to join this event in the Heritage City of Vigan. I will be posting the details of the said fun run as soon as we have finalize the details. Naimbag nga aldaw kadakayo amin, Tarayem! Good day sir, I’m a researcher from the program Case Unclosed. Currently we are working on an episode on the Magsaysay Air Crash. Recently, I came across your post about Ramon Magsaysay and Mt. Manunggal. I was just wondeing if you still have a copy of the book “Portrait of a Cold Warrior” By Joseph Smith and if you do, could I borrow it? You mentioned that there was a part in the book that said that there could be a possibility that the crash was not an accident. caymus, we have the only remaining shoes, which size 11, reserved for you. rfc, thanks for the comment. we will try our best to keep up with our advocacy. dr. jun, thanks for the information. i hope to be there with my runners on your scheduled road race. good luck on your endeavor. marie, i sent an e-mail to your gma e-mail address few days back. my book got lost already and you can get the synopsis of the book from the internet. i suggest you talk to mr ernesto mata of malaya about former president magsaysay. thanks for the comment. Hi BR. Can i request a post? I always notice from your posted pics that you are wearing a rolled scarf on you neck. Is that your anting-anting (amulet)? Also, you are wearing cycling shorts in most of your runs. Are there benefits of wearing a tight shorts? Are you trying to make a running fashion statement? BTW, i’ve reached 999km today. I started Sep 29, 2008. Thanks for the inspiring people to run. It was great seeing you at the restaurant. I was reading your blog and I’m amazed with your accomplishments- your discipline and consistency is something we runners should aspire to achieve. Hey, I hope I get to see you at the Happy Run this Sunday and please stop-by Paul Calvin’s Deli you are always welcome in our place. jay, i guess, i am the last runner to have entered and dined at your place..hehehe..thanks for the invitation. see you at the races. marathon specific program. In addition, I’m following the P90X routine about 5 times a week. Do you think this is overtraining ? joe, thanks for the visit. i do more running than using the P90X. what i like in P90X are the plyometrics, core/abs, & yoga/stretching exercises. these exercises are needed to make you faster, stronger, improve your running form, and lengthen your strides. good luck on your boston marathon. By the way, pls let me know if you have a org club where i can join as member. 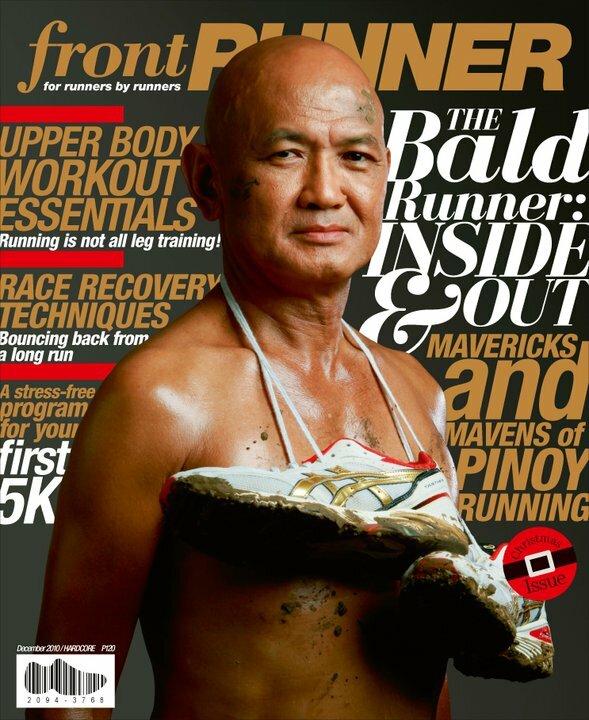 july, i just logged Team Bald Runner as a Running Group at http://www.pinoyatleta.com. you can include yourself as one of the members. nice blog. i just posted a comment on your first post. good luck and see you soon! Hello, Sir Jovie! I’m a former CE of AFPMBAI. However after 15 years of service I opted for early retirement to finish my graduate studies in Media Studies in UP Diliman and eventually seek professional advancement in other companies. Currently, I’m preparing for my compre exam scheduled next month. The Condura Run was my first marathon, although I’m not new to running Im curious as to how the pace is computed and how were you able to document your run per every kilometer? Thank you and best regards. Would it be ok with you Sir if I email or text you in the future? jard, thanks for your comment and good luck on your comprehensive exams. congrats on your condura run finish. i hope you enjoyed the experience of running along the Skyway. i’ve been wearing a Garmin Forerunner 305 (GF 305)watch since Feb 2008 and that is the source of the info/data about my run once i upload it to my PC/laptop. the watch has a GPS and it can track your run through the GPS satellites, thus, it can compute your pace, provide the distance you covered and trace your run through a map. thanks for the comment. Hi sir jovie. I have been wanting to run but when I started last year, I injured my knee. Now, its much better and Im excited to try running again. I am looking for a running coach who can assist/coach me and help me build my endurance. Is there a person/group I could get in touch with to ask for a coach? Thank you so much. I honour you for your passion and commitment to better our people and country. I am very much tempted to run the UltraMarathon but I am a newbie to long distance running. I am not confident if i can do the distance with limited time on hand.I have run my first Marathon last year in Dublin for the benefit of Gawad Kalinga- Philippines. This is a charity organization that helps build communities in Philippines. I managed to convince some people to run the marathon this October 2009 in Dublin. We are inviting you to run here in Dublin this year. Please let me know if you are interested. It would be a great if you can come here and share your passion to the pinoys here. Mabuhay! I will be in Manila again around August and this time staying in Mandaluyong. I have been following your blog and you mentioned that you run around Wack-Wack area. Is it possible for me to train with you whilst I am there? I am hoping to race whilst I am there. I checked the running races with Milo and it seem to me that those are the only exciting events so far? I missed the TNF last year and this year. It’s a shame. I am more of a trail runner and dirts excite me. By the way, I was the one who left you a British Royal Navy Running Vest but seem to have lost in transition. I have another one for you if you are interested. i am a regular runner at the ULTRA Oval Track in Pasig and I hope to join your running workouts during your visit. we can go out from Manila for some trail runs if you have the time. thanks for the running vest. yes, it was lost. hope to see you soon. Thanks for the response. That would be fantastic! What days and time do you normally run in that Oval Track? I will make arrangements nearer to my arrival. I will be there on the 30th of July and will be staying for 4 weeks. Do you know a 10k race on the 2nd of July? I’ve seen a race in bull runner’s blog, however, the longest distance is only 5K. I can’t wait for the holiday and I am so pleased that running has become more popular in the Philippines. C u soon. eire, i really wanted much to help beginners in running so that they will become passionate about it and become good example to the family, relatives, friends, and classmates and able to influence them to be involved in running/active & healthy lifestyle. keep on posting and running. your running journal/blog will help you trace your training. good luck and stay safe! I came across this site when I was googling for info about running. I took up running 4 weeks back, just to get healthy. Initially i could not run for 500m without panting and having severe pain in my shin. I have ready up about warming up etc and gradually have been building up my stamina. On saturday I ran for 10K took me 2hrs. My goal is to gradually build up my stamina and bring this down to 30m and to compete in the 10K Olympic event in 2012! I am 33 years old, very much a beginner in running and over-weight but I believe that if I can do this and get transformed then anyone can! Any recommendations/advise that will help get me to my goal would be much appreciated. I have been visiting your blog from time to time, but didn’t get a chance to give you feedback- because it was only recently that I got my wordpress account. Your accomplishment is really amazing. I’d like to thank you for the nice articles about running. I feel stimulated and motivated after reading your blog last night (the blogspot- where you talked about ultra marathon). This morning during my first 10K race…I thought I’m gonna give up and take a walk….but I kept thinking about that “wall”…. finally I was able to breakfree from running within the confines of my comfort (which is 5K). Maybe I’m not that fast, but I sustained a continuous run….pushing myself when it was easy to make a halt. More Power and I am so glad to found your site in the web. P.S. Btw, you influenced me to monitor my mileage….I really do hope to hit that 1000 K.
congratulations for finishing your first 10k. thanks for visiting this blog & good luck on your first 1,000K finish. thanks for the invitation. i visited your store before your formal opening and i was impressed. you have a nice store! good luck! Idol, thanks a lot on the 1,000Km Club Finisher t-shirt & picture taking today @ Ateneo (I’m the one w/ black cap & beard), the other 1 is my friend Paulo Lukban. Its a runner’s milestone. Regards & more power. I am here in Manila for 4 weeks and I would like to join your training session. I would love to hear from you as soon as and this is my number 09173506385. By the way, I’ve got another vest for you. See you soon. hope to see you soon at the ULTRA Oval Track. enjoy your vacation! We recently formed a Running Club at the office. I’d like to kick off our GA with a Running Clinic. Can you kindly give me details on your Corporate Running Clinics? I am planning to post my application data for and would be honored to be accepted to run in the 2010 Bataan 102. If possible, please contact me offline. I would like to discuss permissability of raising funds for DAV or Wounded Warrior Project in conjunction with the race if I am accepted. Thank you for all of your efforts in putting on this wonderful event. J.O.G. (Joy of Giving) Fun Run Event for Woodrose family and friends will be held on September 6,… 2009 (Sunday) with the running course plotted in Ayala Alabang Village. J.O.G. is for the completion of the three-storey GK multi-purpose center. The running course is mapped around Ayala Alabang Village, with Woodrose School as starting point. Each participant will receive a race packet (shirt, race bib, map). Iron Man in the Making? – The First three for male group and female group for each running category to finish the race in their respective running courses will be given recognition! – Special prizes will also be given to the youngest and oldest participant; the family with the most number of participants, etc! Surprise! I have been tracking my run logs since started running and joining races and i had run more than a thousand km. How do i qualify to 1000-km club? is there a cut-off time? I work in a manufacturing plant in laguna. I would like to introduce running to the employees through our wellness committee by conducting a running clinic. A half or whole day seminar will do. I was asking around for a facilitator and I was referred to you. Maybe you could help me out. In return, maybe we could help your project through fees or shoe donations. We can talk about the details. im neri nama, daughter of felipe (#147 in the list). My father ran already last BDM,.. he really wanted to join this time again. My fault is i missed that the last day of payment is jan 22. i cant go out of school during office hours (im a teacher) . i’m the one attending to this because he lives in the province and he does not know how to go about this stuff. my apologies also. PLEASE tell me where to pay… i dont want to disappoint him because of my fault. PLEASE give me a chance to pay. i’ll visit this site again for your reply. my email, if needed, is neri_nama@yahoo.com hoping for your consideration. thank you in advance sir. This is Maymay Balatayo from Gawad Kalinga. Browsed thru your site and found that you are actively involved with GK. Mabuhay po kayo! We are having a GK Bayanihan Run with the tagline: Run with Gawad Kalinga and Help Rebuild the Nation! this coming September 26, 2010 and we are hoping that you could help us promote the said event in your site. It is part of the CamSur Marathon and they’re giving us a special category called the Bayanihan Category. The run is a fundraising event to raise an amount for a GK village and/or for a GK program and involve not only runners but ordinary people who wants to be part of nation-building and run for a cause. Congratulations sir Jovie for your wonderful achievement! I am a running enthusiast for a year now and did only 9 marathons (5, 10, half, 32k) to date. There is a possibility that I can join your 1st PAU mt. pinatubo 50k trail run this October 9. I’m wondering sir on how to be a member of your PAU? What are the qualifications? i missed the last bdm mtg at the army officers club last friday. my apologies. when will be the next one, mr baldrunner? thanks for ur patience. Hi Sir, were you assigned in Cotabato City before, around 80s-90s? hi sir, would like to ask few questions about organizing a fun run. i am part of our church metro manila youth council and we are gearing towards a fun run event on feb.26. would like to seek help from you on choosing a best venue, race track and other technicalities involved. i joined some of the fun runs, but i still don’t get the technical aspect aside from organizing the event. i hope you could help me with this one. thanks and Merry Christmas! a snappy salute to a great military leader and a dependable running mentor. sir, i am an enlisted personnel of PAF, presently assigned here at zamboanga city. i’m a regular reader of your blog. i’m actively running since 2005. i’d finished 42k twice. i just love long distance running sir,and i have that great desire to do an ultramarathon that’s why i posted a comment on your blog at 2012 BDM 102. i hope and pray that you will consider my application for that race sir. i’ve already started my training for that big event next year sir..and i promise hindi mapapahiya ang AFP sa akin sir. God bless you sir jovie. Hi! 🙂 This is Joanne Pecson from Solar Entertainment (ETC, 2nd AVENUE, JACK TV, DIVA and UNIVERSAL) We will have a a fun run event (Earth Run 2011) this coming August 28 and on Monday, August 25 we’ll have a Bloggers’ Night to Promote this event. Can I have your email so I can send a formal invite for this? 🙂 thank you! How i wish to join the 65km Bolinao run but due to conflict of schedule definitely, i’ll be missing that important event again. Good luck na lang to all ultra runners out there. its a nice place hope you enjoy the beauty of the terrain. oops…….sorry wrong posting pala dito. My bad. Intended for BDM 102k 2012. I will repost this on the correct site. Sir BR, can i use my Mizuno Wave Universe 4 for this Saturday’s 2nd Barefoot/minimalist run? hope n ma finish lhat ng participants ang 102k…tnx nga pla s encouragement and support. awesome blog and articles sir! i regularly visit your blog for inspiration and your run reviews. i am barely a year old in taking up running as a serious sport and i still have plenty to learn. i do dream of finishing a full marathon someday, but for now, puro 5K and 10k pa lang, trying to build up my speed. Hello po, do you accept coaching? We need someone to facilitate a running clinic in our running club here in Makati. Please contact me po – maricel14 at g mail dot com. thanks. i am one of the late finisher in the 32k dec 30, 2011 run. i am wondering where i can get the medal and the shirt? I’m inviting you to join our “Kahit Isang Araw Lang Unity Run” with theme “Run for Education Run for the Solution”. This simultaneous run will happen on January 22, 2012 on the different parts of the country. In Metro Manila the venue will be SM Mall of Asia. The Department of Education: Adopt a School Program will be the beneficiary of this cause. I hope you’ll be a part of this good cause by using you’re God-given strength and endurance in running. We’re having a blogger’s launch for our event and we would like to invite you. Can we possibly get your email address? Hope to hear from you soon! Sir Jovie, i was so amazed and awed reading through your Run resume. There’s so much to learn from you and I found your blog informative and educational. Going through again the comments in my blogsite (http://supladongirish.wordpress.com), I felt so proud and privileged that you have visited it and even commented on it! Thank you. I’m looking forward to joining your 50k T2N in May and BDM 102 in 2013. I recently created my wordpress, and I came across your blog, and it is the most inspiring thing I have ever read. I recently starting running 5K’s (which is nothing compared to what you run) and its my dream to soon run a marathon. Your passion for running is impeccable, and I soon hope to run some of the events you do. Looking forward to more updates on your events! Hi, I will be in Manila visiting family and friends from May to July 2012. I started seriously running about 6 months ago and would like to continue my training in Manila. I can run comfortably about 9.0 miles. In order to continue training in MNL, I requested information from other runnng clubs in MNL but have not received any responses yet. Do you having scheduled training runs in MNL? I am not in your level yet but would like to join your group if that is ok. Enjoy reading your blog and would like to do one of your runs eventually. you can look for your pictures at the Facebook account of J.Avellanosa Photography. thanks! Greetings on behalf of MILO Marathon Team! Iba’t ibang hinahabol, iisang takbuhan. You are cordially invited to attend the Milo Marathon Media Launch on June 21, 2012 at 10:30AM at the Manila Bay Ballroom of Bayview Park Hotel. For media RSVP, you may reach me at group3@seinc.com.ph. Looking forward to hearing from you soon. Thank you for your blogsite. I’m a lone runner. Which means, I run alone. I don’t join fun runs or marathons. I just enjoy running and want to continue to enjoy running. I am planning to do a run in the province (I’m currently residing in Manila), preferrably Illocos, would you know any trails where I can do runs there? If its not a hassle to you. Your opinion will be much appreciated. Hi King, I remember coming across your then small site back in 2007. Am happy to know you have kept on running and blogging. Am still running but not as passionate as those days. I recently re-launched my old site as http://runningspeed.net to try and rediscover my love for running. Cheers. I just happened upon yor blog. Thanks for all the great info! On your list of events or 2014, how can I find out more info about races, like Registration dates? contact info, etc. Most of my events have “Event Page” on Facebook. So, you have to be a friend of my FB account—Jovie Narcise and you can see the details of the race on the Event Page. if you need to know more of the past editions of my races, simply type the name of the event on the SEARCH slot in my blogsite. thanks for the interest. sir i am an aspiring pma cadet, any tips po tungkol sa army dozen? ilang pushups po ba ang gagawin? heheh. 🙂 i have to lose weight and kelangan pa po magpalakas ng katawan. Just want to inform everyone that there is a newly created running community for the Filipino running enthusiast. Visit and join to the community at http://www.runnersforum.ph. God bless! Love your blog, and nominated you for the Liebster blog award! Dear General, I am an American living and working in Metro Manila. In February I am planning to thru-hike from the southernmost tip of Luzon to the northernmost tip, with my fiancee. I’m wondering if you’d be willing to consult with us on the journey. Is there a way I can reach you to discuss further? Thanks for your time. do you have a Facebook account? you can reach me at my Jovie Narcise FB account or at my e-mail address: jovie75@hotmail.com. Hey Jovie, I’d love to interview you for Endurance Sports & Fitness Magazine. Email me at alix@endurancesportsandfitness.com. Great stuff! Hi may I know how to register for the race on 9th of Dec this year? Is medal or t-shirt provided for the race? Thanks! I’m a Filipino living in the US. I’m an ultra runner and I am very interested in learning more on how to train for this race. I would like to run it in 2020. I live in Utah. I train and race in high altitude where the air is dry and thin. I currently run at least one marathon a month and a few ultras in between ranging from 50K-50 miles. I heard about this race from your finishers, Ann Sweat and Kim Travella during a marathon we ran together. My greatest fear is the heat and humidity in the Philippines. Can you please give me some insights to prepare for this race? Thank you! Hi Bald Runner! When I was looking for pinoy runners who blog, you are one of the runners that I instantly saw in google and from then on, I found myself going back to your website. Thank you for the inspiration, sir! I just recently launched my blog too, you are one of my inspirations there po. Thank you for dropping by and being one of my subscribers.